This week’s SATURDAY SIX takes a look at Six Ways To Get Your Disney Fix Outside of the Theme Parks. No one loves the Disney theme parks more than us, but sometimes you just can’t get to them no matter how much you want to be there. So today we are going to look at various ways you can get a taste of WDW, without paying the $90-$95 ticket cost to enter the turnstiles. Be forewarned, the more you quench your Disney thirst, the more you are going to want to book your next trip into the parks. If you haven’t started already, now is the time to build your Disney library. Reading about Walt Disney World (as well as Disneyland and the Disney Cruise Line) is a great way to stay connected with the theme parks, no matter where you are. Anyone reading the SATURDAY SIX should be well versed on travel planning books, such as the Unofficial Guide to WDW 2015, but that theme park bible is just the tip of the iceberg. There are books on finding Hidden Mickeys, books on Disney Imagineers, and books on Disney attractions. I personally love the Imagineering Field Guides (such as the ones for Animal Kingdom and Epcot) because of their small size, allowing me to take them with me on the go without a hassle. As you can see from the pictures above, reading Disney books can become addictive. As you wander further and further down the rabbit hole, you’ll want to find out more about the behind-the-scenes stories, not to mention learning about the people actually involved in bringing our favorite theme parks and characters to life. More and more people are also moving over to e-Books, where not only can you get works such as Sam Gennaway’s Universal vs. Disney and James Stewart’s Disney War, but also Brian McNichols’ eGuide to all of WDW’s bars and lounges. No matter what part of Disney you are a fan of, there is a book for you, so go get it. Also be on the look out for magazines that focus on WDW, including Attractions Magazine or The Source, both of which I could not recommend more highly. Need a shot of Walt Disney World in the arm to get you through the work day? YouTube and other video services can be a fantastic way to transport yourself to The World without leaving your home (or cubicle.) My personal recommendations: Tim Tracker on YouTube – With daily vlogs on their experiences at Disney, Universal, and all sorts of other Florida locales; living vicariously through Tim and Jenn Tracker couldn’t be more fun. Martin’s Videos may eschew the shenanigans of the Trackers, but they bring a level of quality video that is unmatched in the theme park world. Whether you are looking for something current, or a glimpse into WDW history, Martin’s Videos will deliver, and then some. And of course there is the TouringPlans YouTube page, which has everything from merchandise and dining reviews, to complete WDW hotel room walkthroughs. We are in a golden era of podcasts in general, but Disney ones in specific. Whether on your daily commute, at the gym, or doing yard work (oops, I mean shoveling the driveway, forget not all of you live in sunny climates) listening to theme park podcasts can be a terrific way to get your daily dose of Disney. While there are seemingly hundreds of theme park podcasts, I’ve listened to (if not had a guest appearance on) just about all of them, and am here to give you my recommendations. In no specific order (all are available via iTunes): Mighty Men of Mouse, the Unofficial Guide’s Disney Dish with Jim Hill and Len Testa, WDWNewsToday, WEDway Radio, Mickey Miles, The Park Blogger, WDW Radio, WDWToday, the Disney Hipsters, Radio Harambe, Be Our Guest, and Inside the Magic. One of my favorite podcasts for years, The DIS Unplugged, also features an incredible video version of their podcast that is worth becoming destination viewing for theme park fans. So what are you waiting for? There are podcasts on special needs, podcasts on eating gluten-free, podcasts on Disney photography, and even one looking at the “creepy” side of Disney. There is something for everyone. And if you want to expand beyond The Mouse House, take a listen to some of the podcasts focusing on other attractions in Orlando including Parkscope, the Unofficial Universal Orlando Podcast, Orlando United Radio, and the Orlando Tourism Report. The last three items on our list all take place on Disney property, and are ways that guests can be fully immersed within Disney while still staying outside the turnstiles. First up are up Disney’s mini-golf courses, Fantasia Gardens and Winter Summerland. 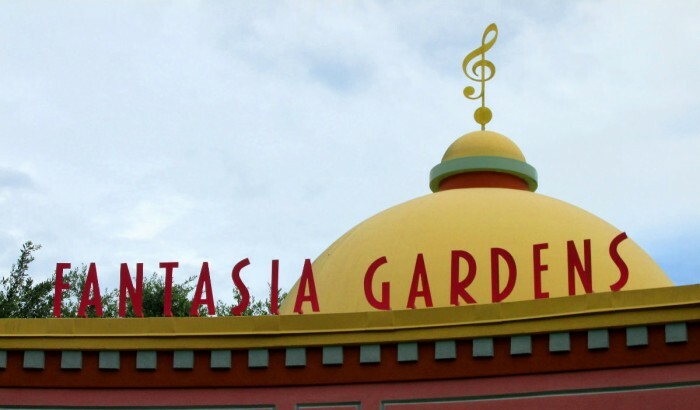 Fantasia Gardens is located near Disney’s BoardWalk area, across from the Swan and Dolphin. Winter Summerland can be found near Blizzard Beach. Now, Orlando may have more mini-golf courses than Las Vegas has hotels, but Disney’s are worth going out of your way to play. Filled with Disney theming and music, these courses are a step above what you are used to. The Fairways course at Fantasia Gardens is the closest thing I have ever experienced to a real golf course being scaled down to miniature size. A must try for mini-golf aficionados. 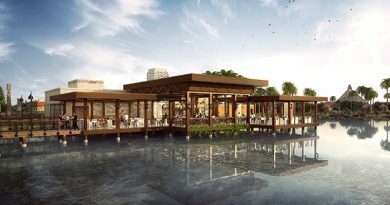 Last fall, the SATURDAY SIX looked at reasons to go to Downtown Disney during its changeover to Disney Springs, and since that time WDW’s shopping and dining district has only gotten better. One of the parking garages has partially opened, making travel to area much easier. Exposition Park, the new home of the Disney Food Trucks, is now open for business and offering food items straight from the Magic Kingdom, Epcot, DHS, and Animal Kingdom. The Marketplace Co-Op remains one of the best stores on WDW property, with unique merchandise based on the Jungle Cruise, Enchanted Tiki Room, Orange bird, and more. The World of Disney remains the world’s largest Disney store (and, believe it or not, it is expanding to become even larger) while the Art of Disney is filled with incredible pieces of Disney inspired artwork. Mickey’s Pantry has character based items for your kitchen. Disney’s Days of Christmas offers stockings, character plush, and ornaments all year long. Meanwhile, Candy Cauldron and Goofy’s Candy Co. bake up the exotic and delicious treats we normally only see inside the theme parks. Exposition Park at Downtown Disney, home of the Disney Food Trucks. With T-Rex Cafe, Fulton’s Crab House, and Characters In Flight hot air balloon, Downtown Disney offers some very unique experiences. One of my favorite things to do at Walt Disney World is exploring their wide variety of resorts. There are the larger-than-life photo ops at Pop Century and Art of Animation, There is the peacefulness of walking through the courtyard of Port Orleans French Quarter (especially after eating an order of beignets.) You can take in the incredible Mary Blair mural in the concourse of the Contemporary, while taking the monorail over to the Polynesian Village Resort to get a Dole whip. Take a walk on Disney’s BoardWalk, where you are also just steps away from enjoying a Kitchen Sink sundae from Beaches and Cream at Disney’s Beach Club. One of the true “best kept secrets” on Disney property are the restaurants and bars at the Swan and Dolphin, including Todd English’s bluezoo. If you have never been, it’s almost impossible to describe what it is like walking into the Animal Kingdom Lodge or the Wilderness Lodge. True Disney magic. There is no charge to wander throughout all of Disney’s resorts, and each is easily accessible through Disney transportation at Downtown Disney. Most of us cram as much possible in our vacations, but I can assure you that a day spent enjoying the best Disney’s resorts have to offer can be just as satisfying and memorable as any E-Ticket attraction. Disney’s Port Orleans French Quarter. Looking out at the Cars wing of Disney’s Animation Resort. Pineapple Lanai at Disney’s Polynesian Village Resort. Part of the Mary Blair mural at Disney’s Contemporary Resort. Orlando also has two Premium Outlet Malls, both of which have a Disney store. These stores carry items directly from the Walt Disney World parks and resorts, so it may be worth a stop next time you are in the area. And don’t worry, if you live outside Florida or don’t have a Disney vacation lined up anytime soon, we do a monthly photo report of the Disney Outlet Store, bringing a little bit a reduced-priced Disney to you. So there you have it: Six Ways to Get Your Disney Fix Outside of the Theme Parks. See you next weekend for the latest installment of the SATURDAY SIX, where the plan is to head into Universal for a bit, but who knows, longtime readers know how easily we get distracted. If you had fun, be sure to check out The Magic, The Memories, and Merch! articles, or, for your listening pleasure, check out the Pardon the Pixie Dust podcast. Special thanks to crack staff photographer Brandon Glover, Best Week Ever’s Daisy Lauren, and Megan Stump for their invaluable assistance with this article. Be sure to also check out Brandon on The Park Blogger podcast with co-hosts Aengus Mackenzie and Brian Carey. Not sure if this fits into the first (6th) one, but I keep my Disney feeling going by reading online. I read blog posts (including touringplans, but also other blogs) and keep abreast of current park happenings on message boards. We are heading to Disneyland in April. In the mean time to get our Disney fix we have Disney themed family fun nights each Friday to get pumped up! I have three little ones so these range from character dress up nights, Disney sing alongs, Disney themed meals, to Disney movie marathons. Yes, we love Disney and there’s nothing better than getting your Disney fix! On this list resort hoping was one of my family’s favorite past times. As a former Orlando resident it was easy to do and so much fun! I have downloaded the Disney theme park soundtracks. These are great, you can close your eyes and visualize riding various attractions!